Kahn Design is a part supplier on the insanity scale between outfitters Mansory and Icon, leaning hard toward this side of "batshit." 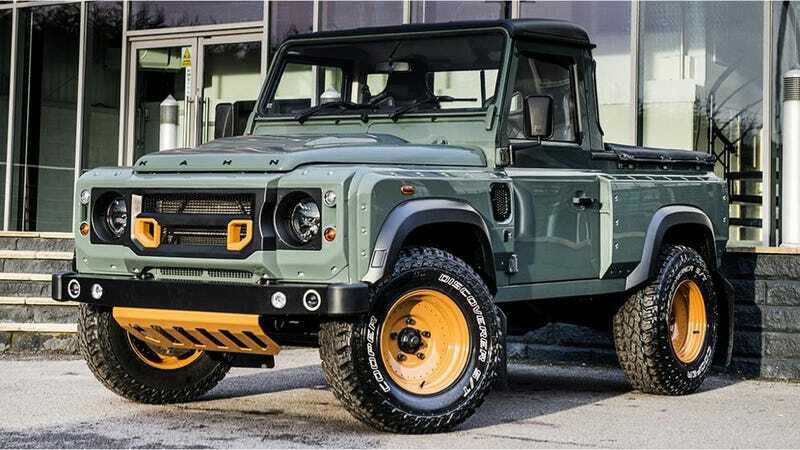 This Land Rover Defender 2.4 TDCI 90 "Chelsea Wide Track" Pickup is what happens when they slap a big dose of body cladding on a tiny little truck. And it totally works. This particular vehicle is put together by the Chelsea Truck Company; a British off-road tuner outfit that turns Land Rovers and Jeeps into mean-looking monsters like this. And they'll sell you this very vehicle for less money than you might think. That front grille is called "X-Lander," and I think Kahn just knocked down a few Soviet apartment buildings to gather materials for the widebody kit. Those wheels are 1939 Defend Retro Dishes, 8.5" x 16" with 275/55/20 off-road tires. Inside the truck gets luxury treatment, with Sports GTB seats done up in quilted and perforated leather. Swap those suckers out for a bench seat with the same quilted design and this short wheelbase Landie is pretty much perfect. Nothing special about the engine, but the aesthetic package looks the business and I'm not one to get fired up about body kits. The whole rig is available to British customers as-pictured for about $43,000, which feels a lot more reasonable than I was expecting. I mean, come on, this or a totally loaded Chevy Colorado Z71? Man, the more I look at this thing the more I love it. Where do I recognize it from? Oh yeah, every Lego thing I ever made. Dear American automakers: don't worry, you can still cram plenty of testosterone into tiny trucks. Now take this idea and crap it out as an American-market 4x4 so I can buy one!